Liquid Studio provides an advanced toolkit for XML and JSON development along with Data Mapping and transformation tools. The Development Environment contains a complete set of tools for designing XML and JSON data structures and schemas. These tools provide editing, validating and advanced transformation capabilities. For novice or expert, the intuitive interface and comprehensive features will help you save time and money delivering a successful project. Visualize and edit an abstracted view of your XML schema(XSD) using an intuitive user interface, and validate your XSD against the W3C standards.Includes split graphical and text views, intellisense, syntax highlighting, drag and drop, copy and paste, and multi-step undo/redo. Visualize and edit an abstracted view of your JSON schema using an intuitive user interface, and validate your JSON Schema against the IETF standards.Includes split graphical and text views, syntax highlighting, drag and drop, copy and paste, and multi-step undo/redo. Edit JSON documents using an intuitive user interface, check the documents are well formed and validate against an IETF JSON Schema.Includes copy and paste, and multi-step undo/redo. Visualize and edit an abstracted view of your Web Service using an intuitive user interface, and validate your WSDL against the W3C standards.Includes split graphical and text views, intellisense, syntax highlighting, drag and drop, copy and paste, and multi-step undo/redo. Convert and transform your Database, EDI, JSON, Text File, Web Service and XML data by mapping fields using an intuitive drag and drop graphical interface. Set breakpoints within the transform, watch variables and analyse the call stack in the step through debugger.Optionally generate a C# source code to run the transform inside your own project. Visualize and edit your XML data in a tree and tabular grid, and validate your XML document against an XML schema.Includes split graphical and text views, intellisense, syntax highlighting, spell checking, document outline, breadcrumb, drag and drop, copy and paste, and multi-step undo/redo. Refactor XML Schema using these automated tools to make global changes to your element and attribute definitions across multiple XSDs. Author, validate and debug your XSLT style sheet, set breakpoints within the XSLT source, watch variables and analyse the call stack.Includes intellisense, syntax highlighting, drag and drop, copy and paste, and multi-step undo/redo. Author, validate and debug your XQuery module or library, set breakpoints within the XSLT source, watch variables and analyse the call stack. Edit your XHTML document, and validate your XHTML against the W3C standards. Includes intellisense, syntax highlighting, drag and drop, copy and paste, and multi-step undo/redo. Edit your DTD document, and validate your DTD against the W3C standards. Includes intellisense, syntax highlighting, drag and drop, copy and paste, and multi-step undo/redo. Edit your CSS document, and validate your CSS against the W3C standards. Includes intellisense, syntax highlighting, drag and drop, copy and paste, and multi-step undo/redo. Construct and evaluate XPath expressions for your selected XML document. 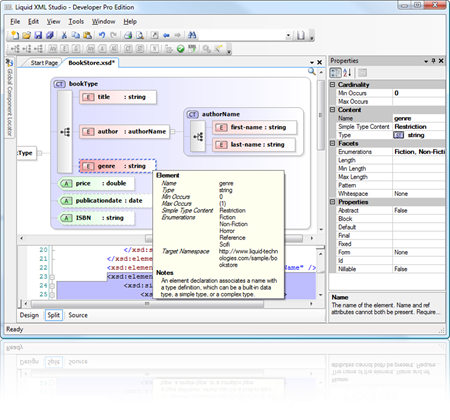 Nodes matching the expression are highlighted within the document, and a tree of matching nodes is displayed in the expression window. Create an XML document based on your XML schema (XSD) using a simple Wizard driven interface. Select the root node and the generator will create all the child elements and attributes, populating them with placeholder values. Create an XML schema based on a set of sample XML documents using a simple Wizard driven interface. Configuration options allow you to customize the generator output, for example to favour complex types or elements. Quickly compare the differences between two XML documents using coloured highlighted sections in a graphical interface. Advanced heuristic algorithms are used to examine the source documents to determine if attributes and elements are new, deleted or have moved within the documents. Several tools are provided to help navigate your documents.A high level XSD Dependency view is provided in order to quickly see the file dependencies of your XML Schemas.The outline view of an XML document is quick and easy way to navigate large or complex XML files.The Document Outline tree is kept in sync with the XML document in real-time as it changes.A bread crumb is also shown which shows all parent elements, making it possible to orientate yourself in large XML documents. The XML Spell Checker knows the difference between XML tags and data, elements, attributes and namespaces.The Spell Checker highlights spelling mistakes in-place in real time as you type, mistakes can then be corrected by clicking on them and selecting the correct spelling. Create an HTML or ASP.Net web site based on your XML schema(XSD) using a simple Wizard driven interface. The generated documentation contains the original schema data, diagrams, detailed properties, type hierarchy, and annotations, hyper-linked to allow simple site navigation. Seamless integration of Liquid Studio within the Microsoft Visual Studio IDE. Supported tools include XML Schema Editor, JSON Schema Editor, WSDL Editor, XPath Expression Builder, XML Sample Builder, Documentation Generator, Infer XML Schema and Web Service Test Client. Quickly call your Web Services using a simple Wizard driven interface. Select your web service URL, pick a web method and run the generated SOAP request.Provides support for HTTP GET, HTTP POST, SOAP, HTTPS, and client certificate authentication. Create an JSON document based on your JSON schema using a simple Wizard driven interface. Select the root node and the generator will create all the child elements and attributes, populating them with placeholder values. Create an JSON schema based on a set of sample JSON documents using a simple Wizard driven interface. Configuration options allow you to customize the generator output, for example to favour complex types or elements. Create an PDF, HTML or ASP.Net web site based on your JSON Schema using a simple Wizard driven interface. The generated documentation contains the original schema data, diagrams, detailed properties, type hierarchy, and annotations, hyper-linked to allow simple site navigation.